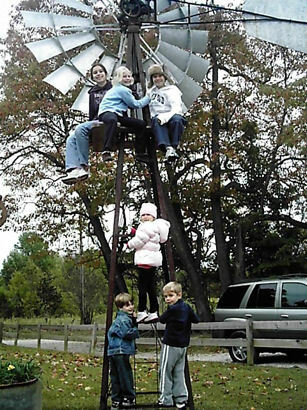 Click here to view the 2012 PBS America's Heartland TV Episode featuring our windmill park. We agree with those who believe that individuals that earn anything from such great historical treasures are obligated to give something back to the community for their enjoyment! That is exactly what we are doing with the creation of our windmill park. If you would like to join the group of donors, noted below, who have been gracious enough to assist in our efforts, you can make an on-line contribution by clicking the donation icon below. With our Grand Opening & Dedication far behind us we continue to make additions to our park. Our goal is to have something new and unique each time you return for an additional visit. We appear to be on track. It has never been our intention to have the largest collection nor one consisting of one of a kind mills. There are plenty of others out there driven by such goals. Consistent with the overall intention of our windmill websites, we are focused on the casual collector and restorer and hope to create and assist entry level endeavers. Over the past 8 years much has been achieved. The land was secured, the park meadow cleared, perimeter fence installed and a small reception building, large display barn & storage shed completed. Gathering and restoring our collection has been a huge group effort. Installations began many months ago on the first mills being moved to the property. All recently erected towers have complete mills on them bringing mills on display and in our collection to 75. We started installing the heads on 4/19/09 and had the first 26 complete mills in place as of 7/27/09. Michael Porterfield of Prairie Legends Windmills in Choctaw, OK was instrumental in our stretch run progress. Our first indoor display facility is complete with 5 short towers erected inside that received their mills in early June 2010. A number of windmill weights and rare tail vanes are hung for display, and we have hung a large group of vintage pictures and windmill collectables that are also available for viewing. We completed clearing an additional 1 acre in Oct. '09 making room for our A-612, 8ft Xray, 6ft Dempster #7, and 5ft Star 37 mills. 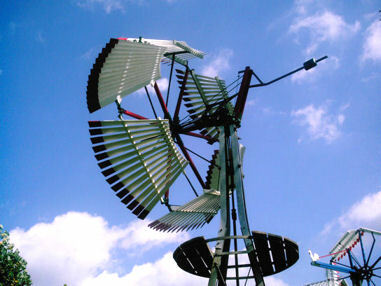 Those mills & towers are now erected with the Zephyr & Xray spinning in the breeze daily. Starting in October 2010 our efforts focused on clearing some new ground for additional mills. 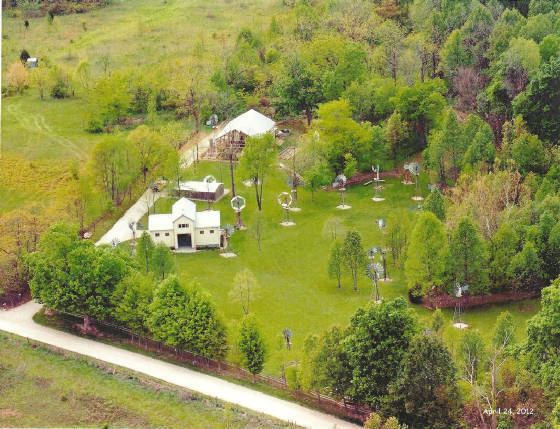 By early November the clearing had been completed and over the next 3 weeks towers for our I.X.L., OK and very early Eclipse were finished and erected. Restorations of the OK & I.X.L. are long since done and those mills are on their towers. The 8ft I.X.L. was donated by the late Dan Andreason the week before his passing. 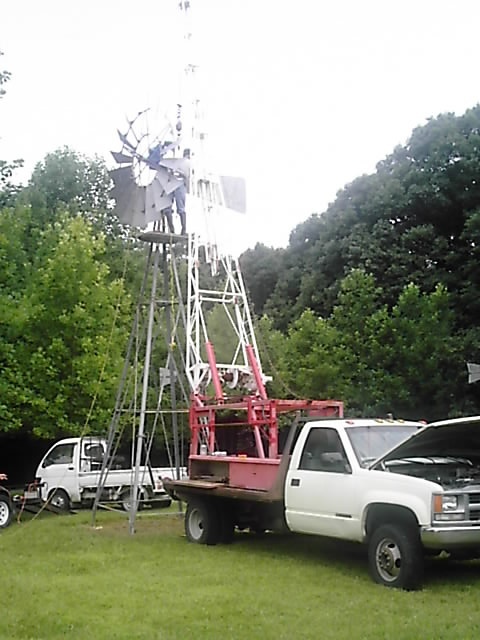 He would be proud of how his family owned windmill turned out as it was expertly restored by our local team with numerous parts from Dan Benjamin of Windmill R Us. 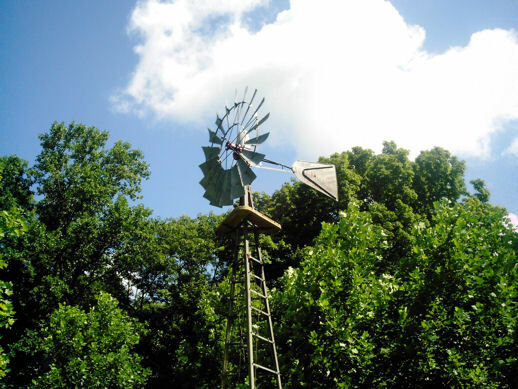 Our local team did equally an outstanding job on the 10ft wood wheel OK sporting new wheel and vane provided by Loren Lockman of Double L Windmills. These two mills, joined by our U.S.W.E. Model B and 1873 Eclipse, flank our 2nd indoor display barn now complete and open. 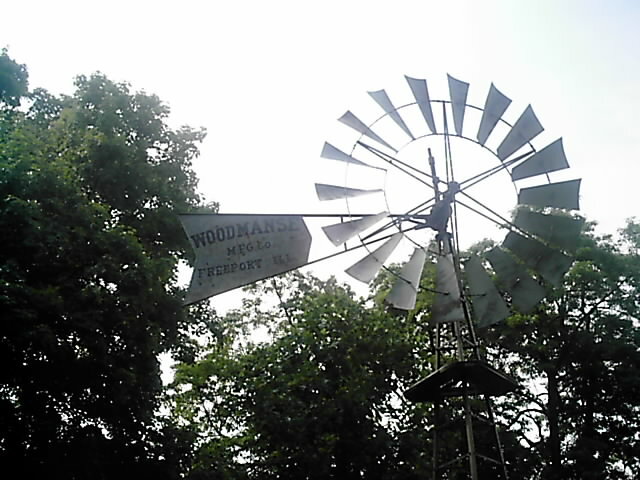 One of our summer 2012 goals was to have all our restored mills erected in time for our 6th Annual WindmillFest. We achieved this benchmark, to a certain degree, with a week to spare making our annual gathering that much more enjoyable for everyone in attendance. We had a record turn out for this yearly get together with RSVP'd visitors from MI, OH, TX, IL, TN, MD & CO on top of local supporters. The food and beverages were outstanding! We'll set a similar interim goal for our 2013 gathering so as to have a new group of additions to show. We hope you might join us for a future event. Focused then turned to final assembly of the mills in our second indoor display barn plus the completion of some of our unfinished restorations. 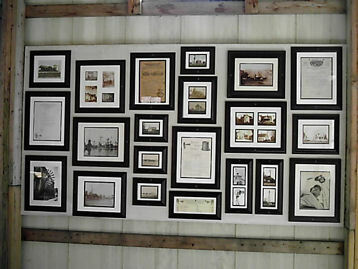 The display barn itself was completed in time for our annual Windmill Fest celebration 10/6/12. 8 of 8 indoor towers were originally installed along with thier heads. All of these rare mills are fully assembled as noted below. We begun adding 4 more towers and mills to complete our Eclipse Copy display in August 2013. The 2011 & 2012 additions to our collection included a 10ft Star #7, secured with the help of Don Hodges, of Coldwater, MI, a very rare 8ft Perkins Steel Single Gear mill along with its earlier counterparts, a 10ft Perkins Wood Solid Wheel & 10ft Steel Wheel Perkins DM, as well as an 10ft Original Monitor purchased in NE. The Star #7 is done and erected. The Original Monitor & Single Gear Steel Perkins are now complete and were both erected in our new indoor display barn during the Summer of 2012. We also acquired the Dempster #9 belonging to the late Lester Mishler in 2011. This mill along with several other items from his estate are also featured in our new display barn. On our Fall 2011 trip through the central U. S. we picked up the majority of a Plattner-Yale Eclipse style mill while crossing Iowa. Our early Spring 2012 trip helped us gather the final pieces for our Fairbury #5, the Star #7 and our 6ft USWE Model F. The Fairbury #5, Plattner-Yale & USWE F have also been completed and erected outdoors. The Woodmanse Solid Wood Wheel & Dempster #9 are finished and already on display in the newest barn joined by a 10ft Axtell Roller Bearing mill. For Christmas 2011 Santa brought us a 10ft Elgin Hummer L with steel wheel with assistance from Dan Benjamin. 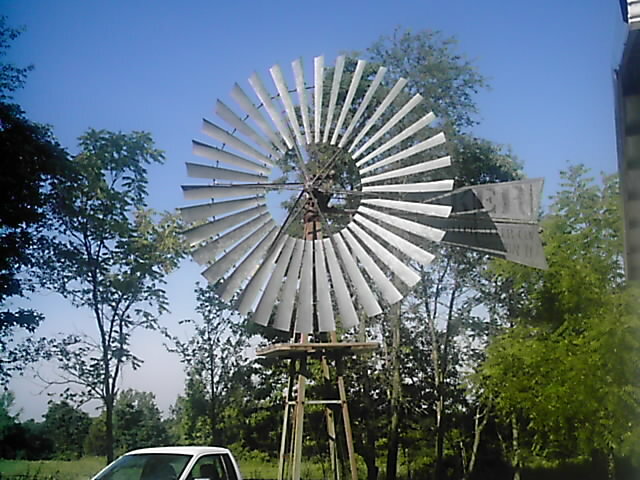 We picked up the last pieces for this mill at the June 2012 Windmiller's Trade Fair in Batavia, IL along with a 10ft wood wheel Star #15. The Hummer L erecting was completed 8/10/12 and it is now on display in our 2nd indoor display barn. The Star 15 was finished mid December '12. 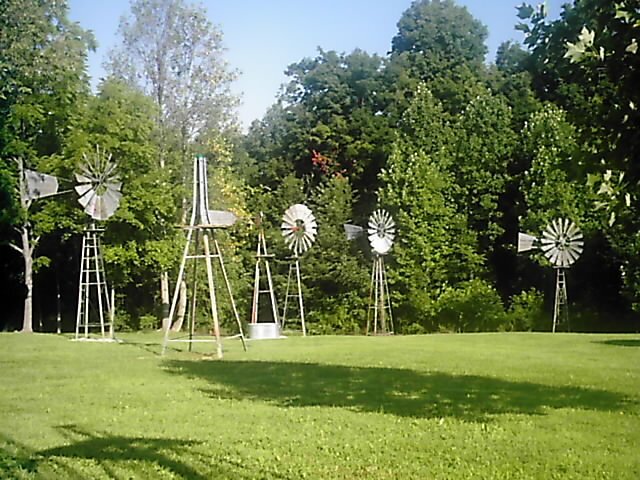 We finished several mills scheduled to be erected in 2013 for our Fall Windmill-Fest get together. 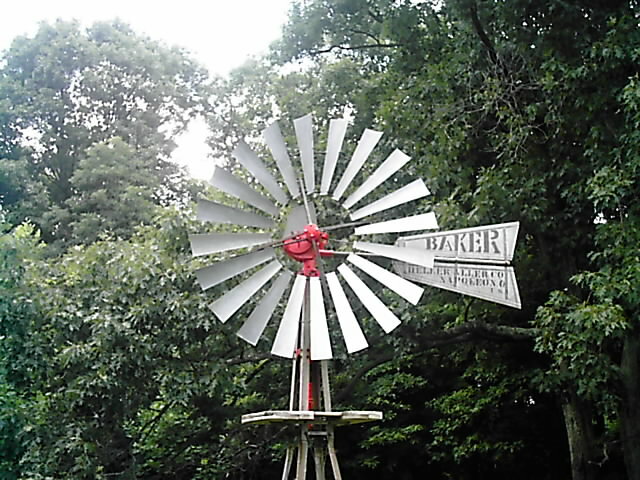 We completed the 6ft Elgin Wonder B that was restored for us by Dan Benjamin of Windmills R Us the week of 9/1/2013. We are done with our 8ft Ideal Steel and finished the 10ft Perkins Steel Direct Motion, the later acquired from Roger Bailey, of York, NE. That Perkins is already on its tower. Jack Kellenberger of Star City, IN helped us purchase an 8ft specimen of the original Freeman Steel early in August '12. This mill is now complete and was the first mill of 2013 we erected. We also erected our 8ft Goodhue Standard in the week of 7/15/13 as we were able to secure the last missing parts with the help of Ivan Block, Wausau, WI, on our mid Nov. 2012 trip and its restoration was finished before last Christmas. Our Ideal Steel and U-top Freeman Clipper were finished and erected the week of 9/7/13. And just when we thought we had added our last mill for a while.... With the help of Dan Benjamin, we added a Bell Hub Aermotor to our list of future projects. 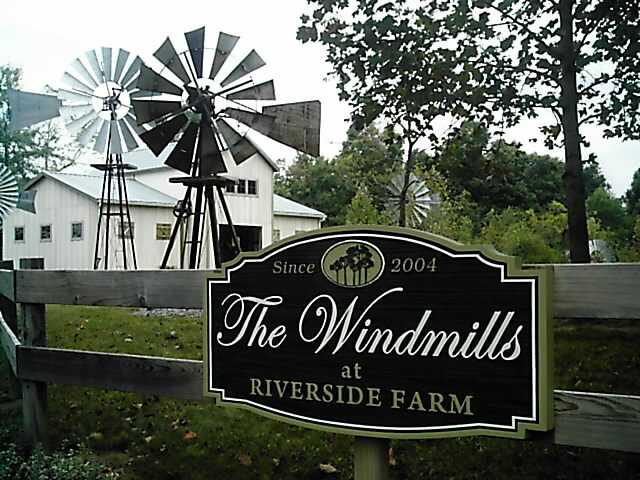 That mill was moved to the park following our November 2013 trip and will be displayed as a unique posted mounted mill above a shed completing a display showing how windmills were used to complete tasks beyond pumping water. As part of our April 2013 trip we brought home a rare U-Top Freeman open gear and a very rare Fairbury #2. 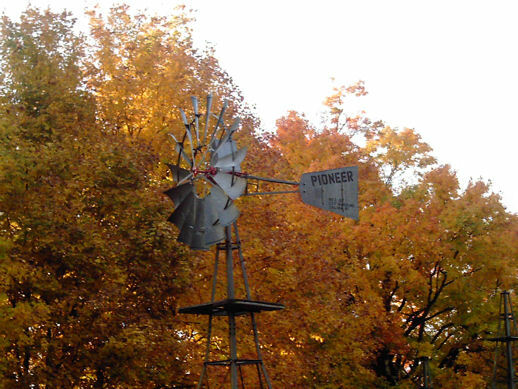 These mills were purchased from a collection of items tough financial times forced Peg Muller of Yankton, SD to sell. The Fairbury #2 has already gone up in our display barn #1 as a Suderland Sun version mill which was made by Fairbury under contract. Our April trip also saw us drag home some other interesting display items including a large collection of unusual tail vanes, many of which have already been hung on walls in our display barns as well as crated original wood wheel sections for our 10ft Perkins along with an original vane that has already replace the reproduction vane we had mounted earlier. Our June 2013 trip afforded us some spectacular finds for our collection. We had the opportunity to dig treasure on the Nebraska Sandhill Ranch of Jordan Skinner. We literally dug up a 10ft USWE E and 10ft Plattner Yale #3 along with a Vaneless Aero-Matic and several thousand pounds of other iron. The USWE E & Plattner Yale mills join our collecton of Eclipse copies. Our Novembr 2013 trip was special as we brought home a very rare Dempster #5 along with the beginings of an 8 1/2ft Red Cross Solid Wheel mill and an open gear Althouse-Wheeler Steel Giant. To the best of our knowledge it is our understanding only 4 Dempster #5's exist with the other 3 being in collections of Roger Bailey, Lynn Westcamp & Dan Benjamin. Our April 2014 trip netted some great finds for our collection. We picked up a early production version Duplex Superior with the help of Allen Tacheny of Stacy, MN. We also traveled to the border of SD/WY and picked up a 12ft Eclipse that has since been sold to a collector in Texas. 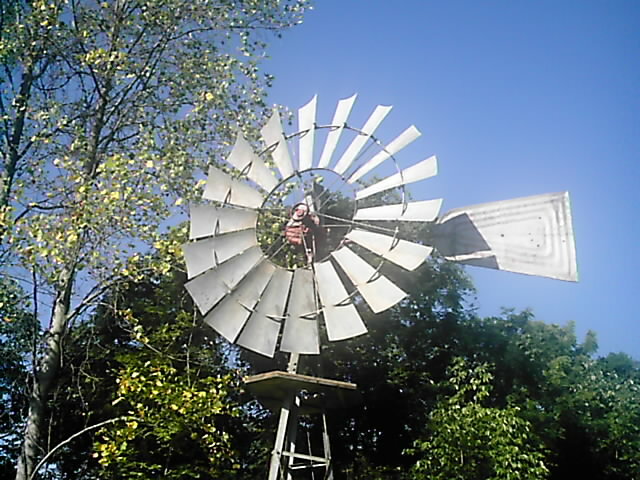 The Superior is in the final stages of restoration having secured the last missing parts from windmill Ivan Block of WI. Early Spring 2014 was no different than any other previous early Spring as we rushed to finish certain projects and do our winter clean-up prior to our Spring reopening. On the colder days our efforts found us finishing the final touches on new tail vane wall display additions as we were fortunate to pick up some outstanding and unusual items during the 2013 Fall & Winter seasons. Our Summer focused turn to completing unfished restorations in hopes of having several items erected in time for our annual Fall events & tours. 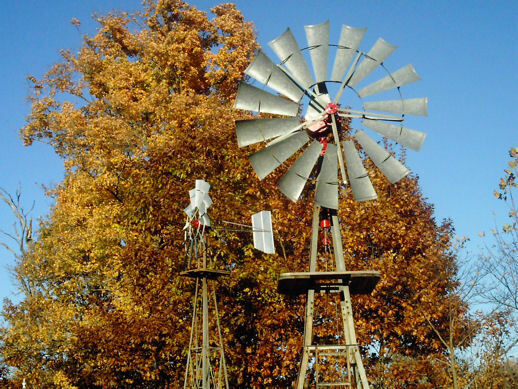 Our rare Dempster #5 & Steel Giant were erected in time for our Fall 2014 WindmillFest event. Fall & early Winter 2014 offered some opportunities to acquire a group of unique mills. We added a 10ft Original Dempster Vaneless, the earliest bobtail version, plus a Fairbury #6 Worm Gear mill. 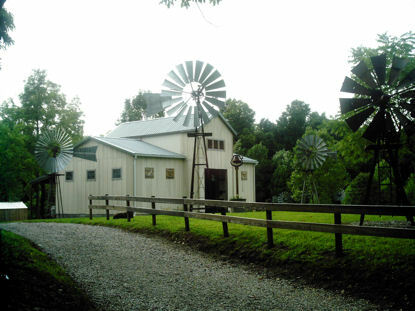 Both mills came to us through the estate of the late Lynn Westcamp. 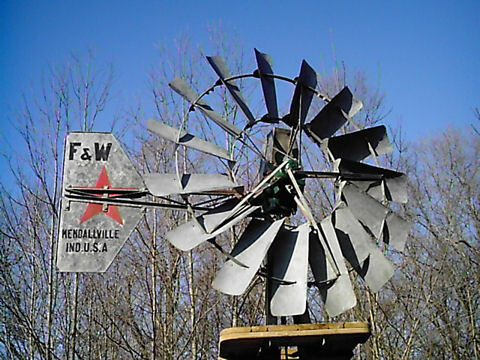 We also added nice 8ft & 10ft versions of early F & W Steel Star Direct Stroke mills from private owners in MI & OH. Both mills are increasingly rare and are great examples of the first all steel mills offered by Flint & Walling. We will add all four mills to our display offerings at some point in 2015 once restorations are complete. Summer 2015 offered the chance for another small group of additions to the collection. 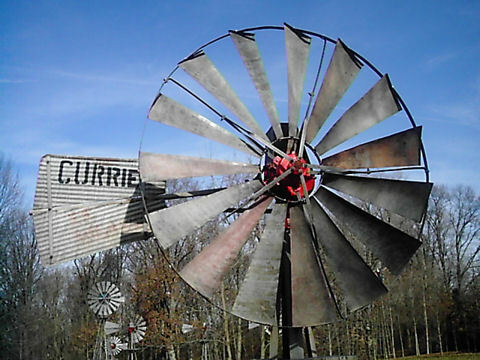 We acquired an 8ft Currie Oil Bath mill, seldom seen outside of KS, as well as a very rare 6.5ft Wards Air Chief. The Air Chief was made by Stover Mfg. Co, & later by the Woodmanse Mfg. Co, under contract for Montgomery Wards. 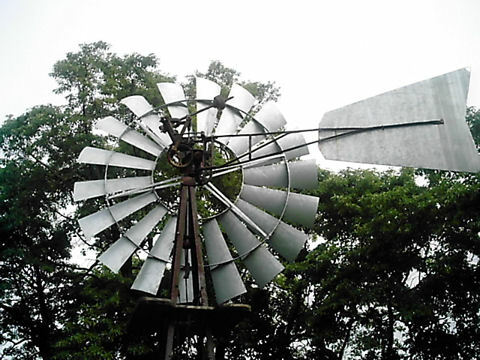 It was assembled during WWII from components of multiple windmill models making use of parts inventories that were limited given "War Effort" bans on the manufacture of iron & steel parts for non military related equipment. 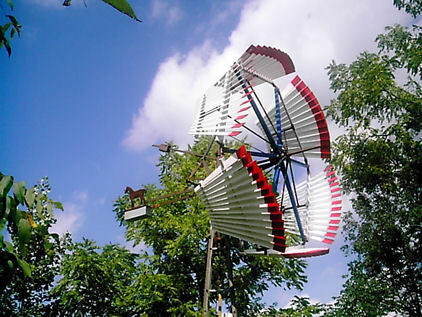 The Air Chief was one of the few new production mills offered during the WWII restrictive manufacturing period which led to the closure and consolidation of many windmill manufacturers who simply went out of business given the inability to make product. With a focus on retirement we decided to "cull the heard". With duplicate mills in storage, in addition to recent acquisitions, we decided to offer a handful of mills in our collection for sale. Some of those are still viewable as listings in our eBay store should you have interest in acquiring one of our treasures. Those we have SOLD are noted as such below. Many of those that remain are earmark for kids & grand kids. Given we have greatly reduced the size of our collection during the past 18 months, we are currently open by appointment only. Admission will is still FREE. Call us ahead of time once you know your visit schedule. Mills included currently in our collection are noted below. The asteric * indicates those mills not yet on display. 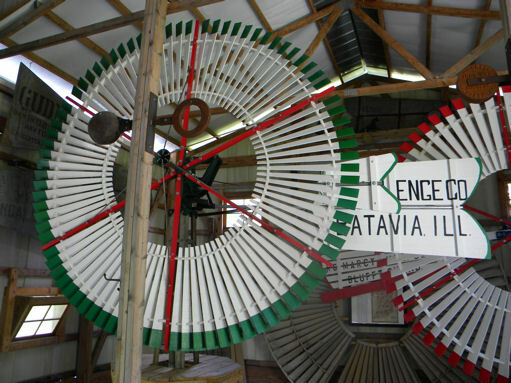 Mills that have been sold as part of our retirement plans are also noted. We have posted pictures below of many in our collection and as shown the change of seasons brings a new perspective to each of these historical treasures. 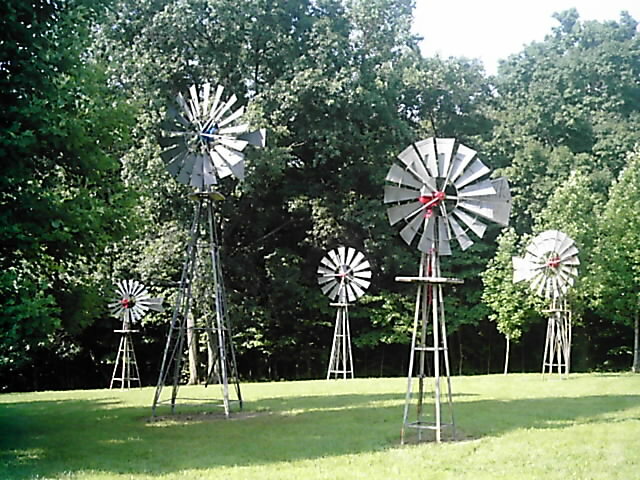 The pictures below show only a small portion of the windmills on display at our park. Our Woodmanse Steel, A-502, Star 12 & AirMaster erected 7/21/09. Our collection is displayed in a park like setting surrounded by trees in a beautiful farming community. Our 10ft Big Spear Challenge Vaneless. 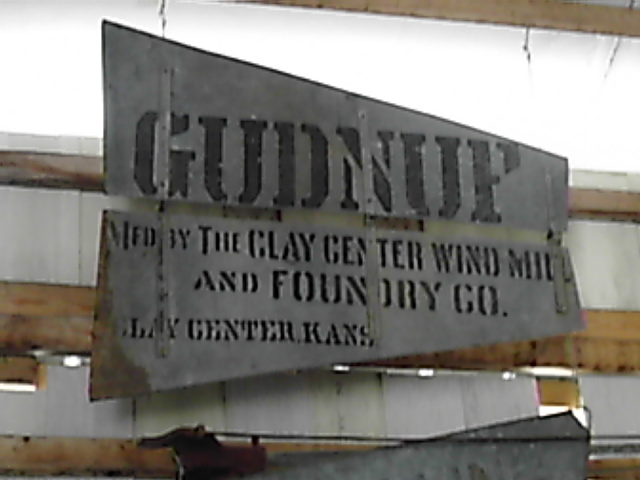 This mill was aquired from the family who originally erected it near Columbus, NE. 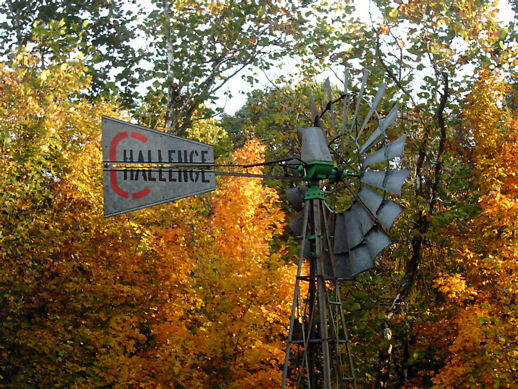 Originally produced from 1927 until 1941 our Challenge 27 was first erected in Kansas. 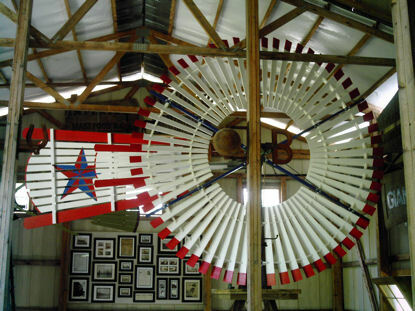 Our 8ft Parish Windmill is a unique chain drive mill designed by Gus Parish, of Earth, TX, for a friend looking for a simple mill design. Commercially available in TX, OK, NM & KS for only a few years. The Woodmanse Steel Back-Geared Mill was introduced in 1892. Ours was acquired in eastern Nebraska after many years of service. 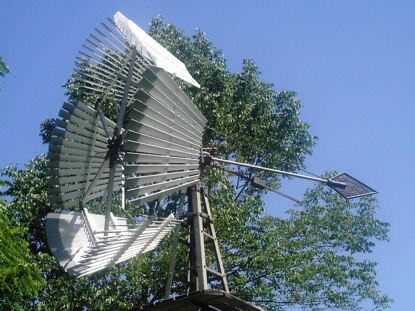 Our 6ft Oil-Bath Currie is an outstandy example of "The Poor Man's" windmill manufactured in Kanas. As you enter the park, on your way to one of two indoor display barns, you're greeted by a 6ft Samson Steel & 8ft Kenwood. Our 10ft Original Star on its indoor tower along side 4 other wood wheel mills including a 10ft Eclipse, 10ft Red Cross, 10ft Challenge D.S. 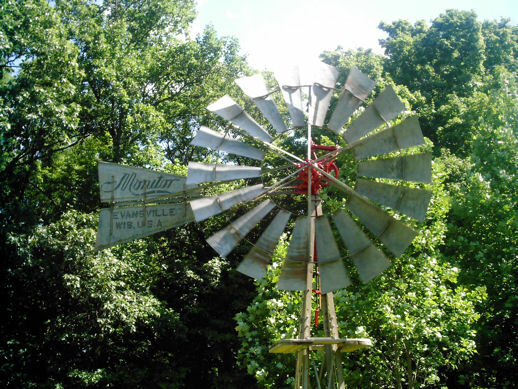 & Monitor L.
Originally sold by a distributor in Oklahoma our 8ft Airmaster was restored by Micheal Porterfield of Praire Legend Windmills. 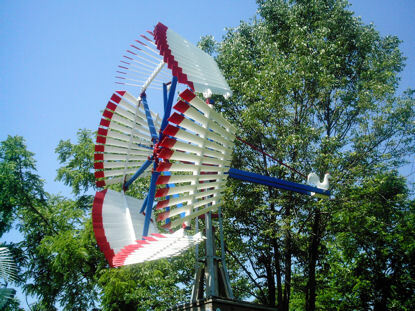 Our 8.5ft Eli, erected 7/20/09, was produced by the Kregel Wind Mill Co. located in Nebraska City, NE. 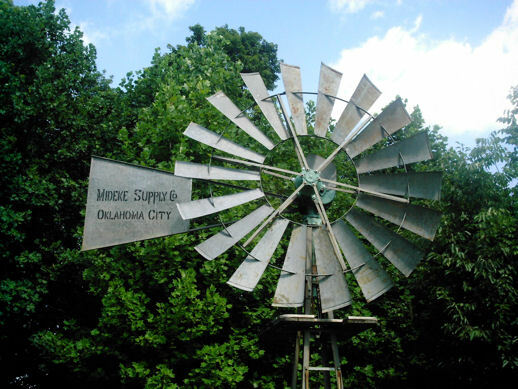 Distribution of this direct stroke mill outside the surrounding 75 mile area was uncommon. Our 6 1/2ft Monitor WB earned is spot in our collection as a limited production "pull-out" version. This was the first mill aquired in our collection. It operates our "Texas Hot Tub" as shown below. in the indoor display barn. Pictures are a great source of documentation. A 10ft Woodmanse Direct Stroke, from Freeport, IL now on display. 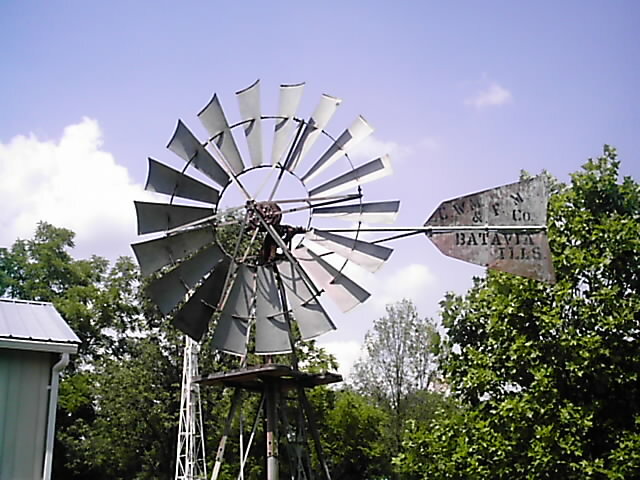 Our Dempster 12A, one of eight Dempster windmill in our collection. 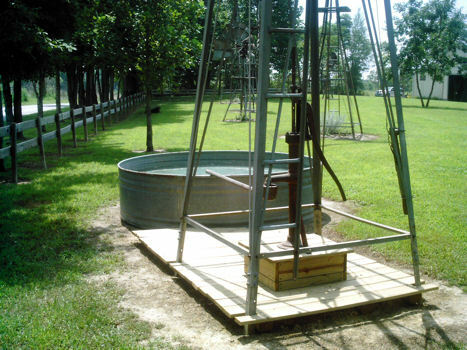 Bring your bathing suit for a cool dip in our Indiana version of a Texas Hot Tub supplied by our Monitor WB. 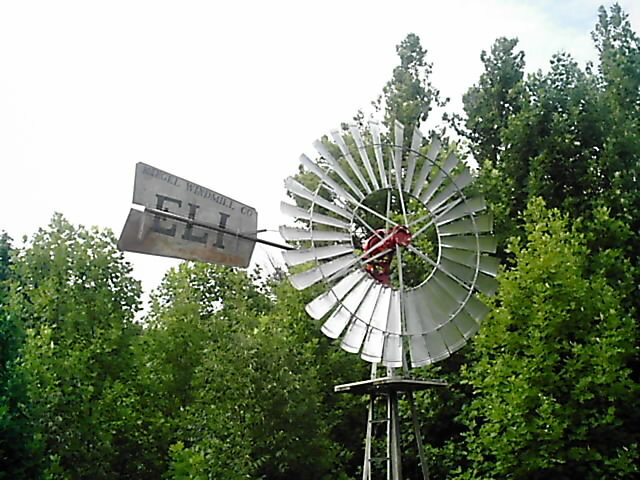 Our original Valley Industries X-802 Aermotor was erected 7/20/09. Our 10ft Dempster #4 completed during our mid-August 2010 work day. 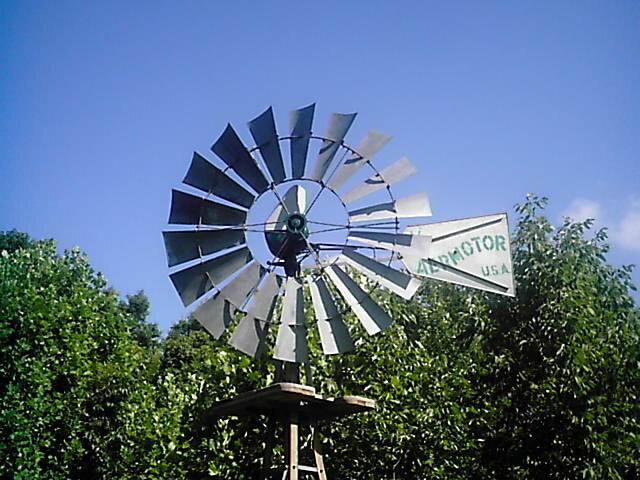 Our 8ft Kenwood completed 8/4/09, sporting a freshly dipped wheel & vane produced by Dan Benjamin of Windmills-R-Us. 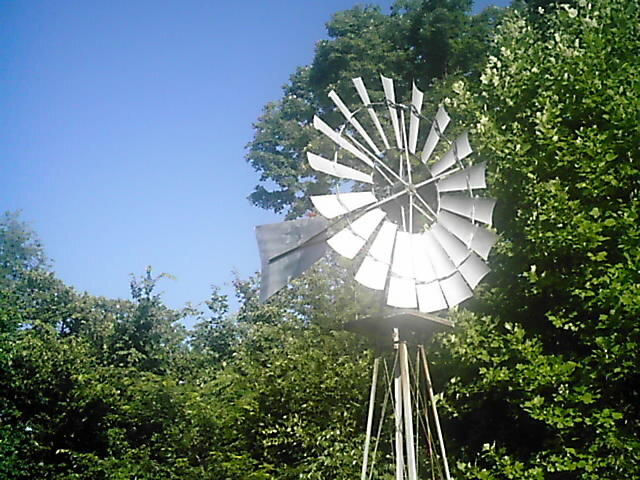 Windmill historian T. Lindsay Baker has written about the mill that was "Good Enough", produced for local residents in No. Central Kansas. Our 8ft A-502 Aermotor is an exceedingly rare model given its limited production run due to signifigant design flaws. Restored to pumping condition by our local team. 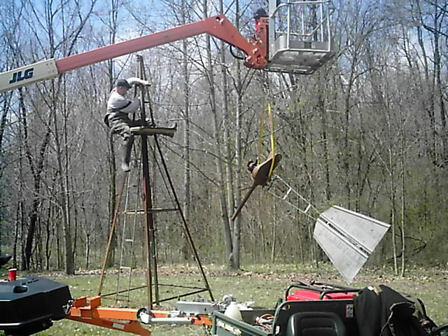 T. Weber & M. Porterfield help erect our Parrish windmill. One of the favorite displays of our visitors. Comparative Tail Vanes and Bonnets from 18ft and 6ft Dempster #12's. Everyone loves to pose in front of this display for thier group photo's. 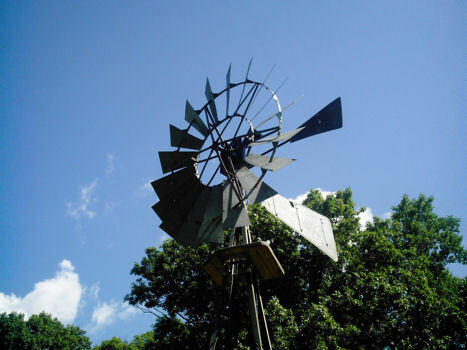 Our Elgin #2, restored by Loren Lockman of Double L Windmills. Extremely rare as fewer than 12 are known to exist. Made for 20+ years begining in 1910 this Monitor model K came to us from Nebraska. The Monitor "Hambone", named for its resemblence to a large ham, was Baker's first Self-Oiling mill. Our small 6 1/2ft version is unique given its shallow pumping capacity. Originally erected in South Dakota. Our Bobtail Raymond, restored by Loren Lockman, was aquired in central Kansas where it had been originally purchased in the late 1890's. is a rare mill sold in limited numbers. 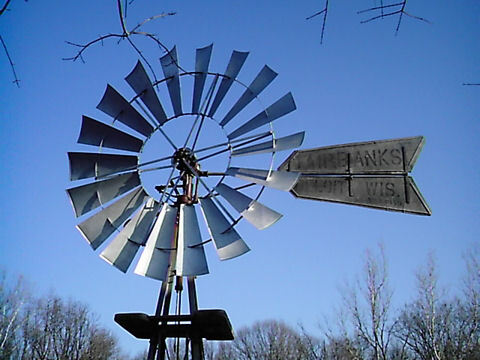 the help of Micheal Porterfield of Prairie Legend Windmills. 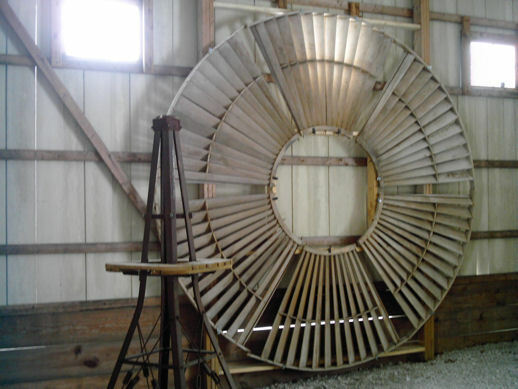 A vintage 12ft wood wheel from a New Globe Wind Mill, purchased in Logonsport, IN, has been hung on one wall inside our display barn where 5 other complete wood wheel mills are displayed. Produced between 1912 and 1926 our Star model 12 is a open double gear workhorse we aquired in Colorado. A seldom seen 6ft Michler Fairbury as produced by C & P Machine of Salina, KS. Ours was located in service on a Texas ranch. 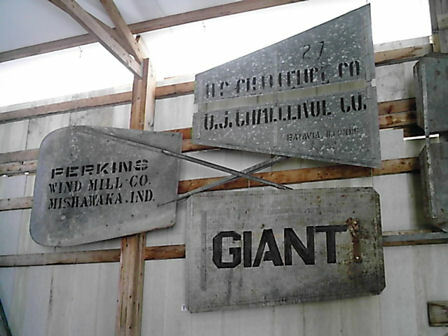 Several vintage vanes are displayed in our barn including these examples from the Perkins Wind Mill Co. of Mishawaka, IN and Althouse-Wheeler Co. of Waupun, WI. Our collection includes numerous models produced by the Aermotor Co. This 6ft X-702 spins proudly atop its 21ft 3 post tower. a group of frequent volunteers. Our 5.5 Baker Heller-Aller as produced by the Napolian OH based company. A 10ft Challenge Direct Stroke flanked by our 10ft Red Cross Solid Wheel displayed indoors with other wood wheel mills. 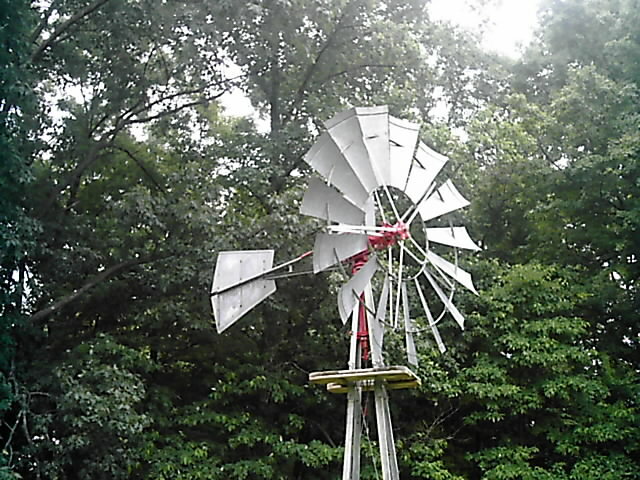 Our Dandy, manufactured in Batavia, IL, erected near our indoor display barn. Dempster 12A & 12 installed 7/21/09. 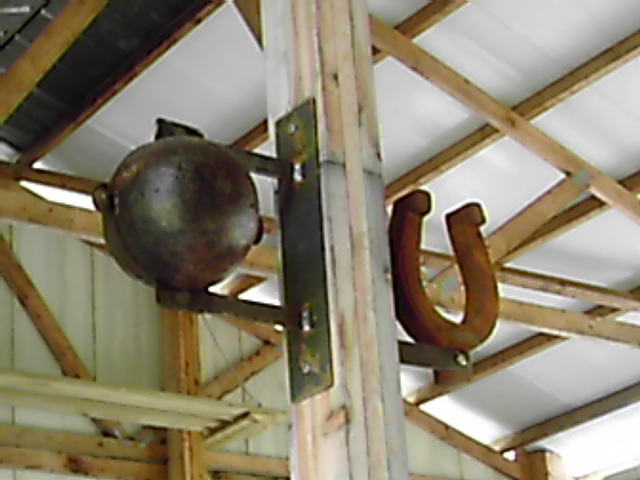 Some of the windmill weights hanging in the rafters of the indoor display barn. Many more are on display including a Battleship from a 12ft Baker Model M.
Our Fairbanks is known as the first widely distributed all steel mill made by Fairbanks, Morse & Co. in 1895. Though first introduced in the 1890's our 6ft Samson Steel was made sometime after 1920 as it is the final Hyatt bearing version produced for a few years prior to being discontinued. Young windmillers in attendance at our Grand Opening & Dedication. Please contact us for details on how you can make a contribution to these efforts. Yesterday morning I learned the sad news about the passing of Bill Neese. Bill's name has been at the top of our Donor Contributor list since it was first publish. Bill was a very special person. I considered him a great friend. I looked forward to his visits each time I was out at our place. He and I shared many great stories musing about earlier times in the Poland, IN area. His longtime connection to the Weber family made for interesting historical background chat since I did not join that extended family until 1995. 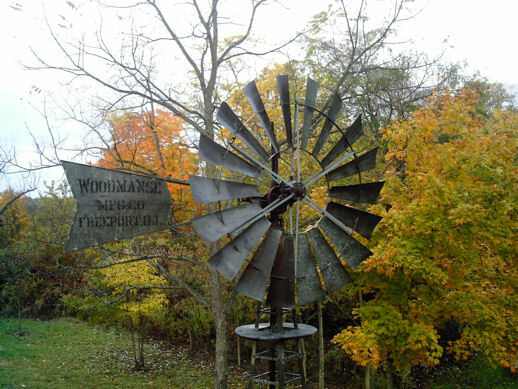 I have been forever grateful for Bill's assistance in acquiring the Kenwood Steel windmill & tower off the Smith place since its original owner was my wife's great, great grandfather Tressel, Helen Weber Scherb's grandfather. 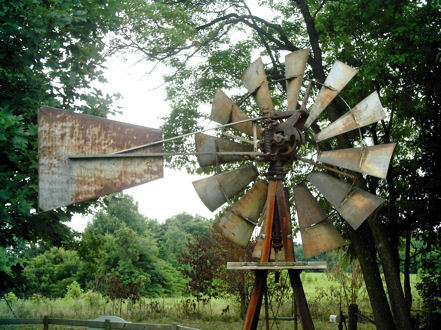 Helen, my wife's grandmother, talked about watching her grandfather erecting that windmill when she was a young child. Helen, then in her 80's, was thrilled when its restoration was completed and it was erected at our place. 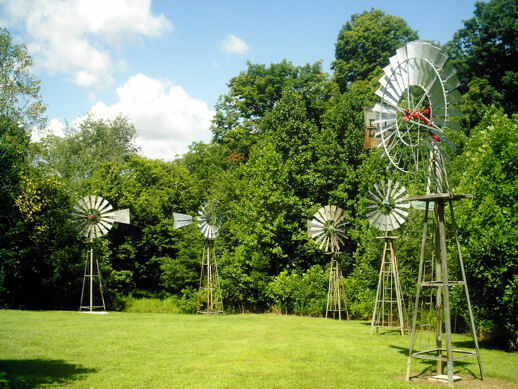 I have told the story behind its addition to our collection many times as I conducted tours at the windmill park for the numerous schools, church groups and civic organizations that have visited. A mention of Bill's role was always part of the story. 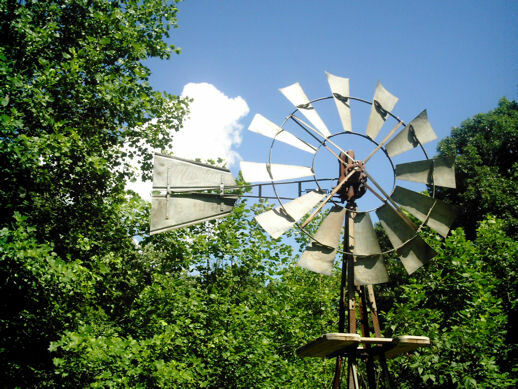 Bill's name has been a fixture on our website dedicated to our love of windmills since it first appeared online as he assisted with many projects in the early years of our park's existence. Bill and I discussed our own mortality several times over the past few years as he lost many friends, including Helen, who past before him. He was grateful for their friendship and thankful he had lived a wonderful life surrounded by family he cherished. As his body started to break down in his later years from the riggers of the farm life he loved, his mind remained sharp and he had no regrets. I sadly recognized during our last visit in mid November that given my infrequent trips to the park during the winter that that visit might be our last. I had hoped it would not be the case as I sensed the void created by his passing would be a tough pill for me to swallow. A few years ago after we had the very tough winter Bill talked about how even in the toughest of times God provides enough for creatures to survive until better conditions arrive. At that moment we were talking about wildlife and his cattle, but I knew his perspective was much broader and applied to his own life too. I will greatly miss Bill Neese. Simply Click On The Donation Icon.